As you play, you may notice something…strange. Besides the fact that the school is entirely populated with birds, I mean. Wait. Why is the school entirely populated with birds? Why don’t you ever see any other humans? Why do you live in a cave and constantly refer to your hunter-gatherer instincts? Why does creepy music play every time you talk to doctor bird? But forget all about that! 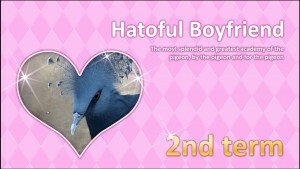 You’re here to find love, and Hatoful Boyfriend is all about love. And tragic backstories. And love. See, the amazing thing about this game is that, despite the fact that you are seeing birds on the screen and they constantly do bird things and make terrible bird puns and treat you as Other because you’re human, you don’t think of them as birds, but as people. Surprisingly complex people, who reveal themselves to you if only you allow that connection to be made on a deeper level, if only…sorry, I’m getting teary about a conversation I had with best friend bird. So here’s how this game works: you read screen after screen of dialogue as you interact with characters (birds) throughout the school year, and occasionally you make either dialogue choices or plot choices. It’s very simple! (Thankfully, you can fast-forward through dialogue you’ve already read when you replay or else this game would be interminable.) You’ve got to pay attention to your target’s interest, though, and romance him the right way! You…you should basically stalk him everywhere he goes and do all the after-school activities he does and invite him to every possible social engagement and this is how romance works, right? It does when you’re a human teenage girl trying to get with a pigeon, okay. The game rewards you when you’re on the right track, providing sweet scenes between you and your intended, be it your math teacher—yes, you can hit on your math teacher—or the bird obsessed with pudding. There is a bird who is completely obsessed with pudding, just go with it. 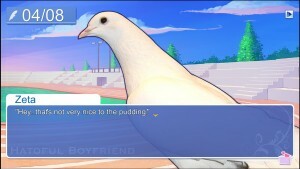 The most brilliant thing about Hatoful Boyfriend is that it lures you in with its offbeat charm and ridiculous premise and then launches an unrelenting assault upon your emotions. You will confront your own mortality and that of your true love, thanks to a pigeon. You will call your brother and tell him you love him, thanks to a pigeon. Or you will wish you had a brother, just so you could experience the incredible bond between two pigeon-brothers. This game is a Trojan horse, a black swan, a Trojan swan, and you are not prepared for it. After you acquire enough endings, you will be given another choice. A new option. And if you have been paying attention, you will know that there is far more going on in this game than bird romance, and trust me, there is far more going on in this game than bird romance, and I cannot even begin to describe what awaits you, partly because it’s goddamn bonkers and partly because it moves out of the Mothership Zeta realm of fun; we would totally reject this story if you submitted it. And yet! 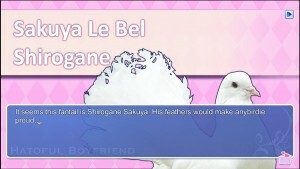 Like I said, Hatoful Boyfriend is all about love. Love between friends, love between family, love between human girl and bird boy. Though it will put you through the emotional wringer, you will come out cleansed and purified, a being of sheer compassion and hope, believing that anything is possible. A human can love a bird, a bird can love a human, and a pigeon dating sim can somehow be one of the most harrowing, moving experiences you’ve had all year.